Library collection management is a vital part of any library’s operations. 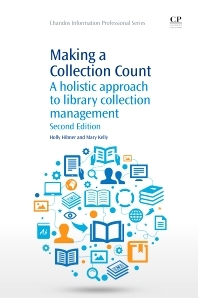 Making a Collection Count takes a holistic look at library collection management, connecting collection management activities and departments, and instructs on how to gather and analyse data from each point in a collection’s lifecycle. Relationships between collections and other library services are also explored. The result is a quality collection that is clean, current, and useful. The second edition includes expanded information on collection metrics, digital collections, and practical advice for managing collections effi ciently when time and resources are tight. It also includesmore real-life examples from practicing librarians in areas such as workflow analysis, collection budgets, and collection management techniques. Chapters cover the life cycle of a collection, understanding workfl ow and collecting metrics. Physical inventory, collection objectives and bookmarks, as well as collection organization, collection budgets and marketing collections are also discussed. Holly Hibner received an MLIS from Wayne State University in Detroit, Michigan in 1999. She is the Adult Services Coordinator at the Plymouth District Library in Plymouth, Michigan. Mary Kelly received an MLIS from Wayne State University in 2002, and also has an MBA from Wayne State. Mary is an Adult Services Librarian at the Plymouth District Library.